Williams Automotive Inc. Offers Auto Repair Services You Can Count On! 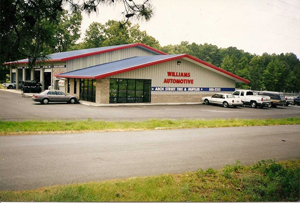 Since 1992, Williams Automotive Inc. has provided motorists in the Little Rock, AR 72206 area with comprehensive auto repair services that include Brakes, Car & Truck Care, Electrical Services, Electronic Services, Engine & Transmission, Engine Maintenance, General Services, Heating and Cooling Services, Miscellaneous Services, Tires, Towing, Transmission Services and Undercar Services. Our goal is to offer the best services available at affordable prices to get you back on the road in no time. For a high-performing vehicle, trust Williams Automotive Inc. with your car, truck, or van. To learn more about the services we offer, please contact us by phone at 501-888-2255 or send us an email. We also invite you to learn more about our dedication to you, our valued customer. Fair, honest, and good to deal with. They could be a bit faster on getting parts, they could be located better. But really in spite of those two things there is no one I would rather trust with my cars. I tried someplace else just to be closer to the hose. That was a huge mistake. These guys are AMAZING!!!!! They will treat you like family and as if your car was their own. They don't upsell you on anything. They just tell it like it is, and get straight to the point of your problem. They're thoughtful, kind, generous, and they know what they do and do it well. I HIGHLY RECOMMEND them!!!! These guys are AMAZING!!!!! They will treat you like family and as if your car was their own. They don't upsell you on anything. They just tell it like it is, and get straight to the point of your problem. They're thoughtful, kind, generous and they know what they do and do it well. I HIGHLY RECOMMEND them!!!! Good place to take your vehicle to get worked on and not to expensive. Nice staff and fast. Dennis and his team have taken care of my vehicles for 13 years. Been to other places when I had to but dont get service like I get here. Honest and trustworthy. I won't go anywhere else. They do good work. They are kind and professional. Nothing but great people and great service at Williams Automotive! I have been using them for several years and they have always clearly communicated the anticipated cost and time to complete repairs. They do what they say and are genuinely concerned about your satisfaction. If you are looking for someone to do an oil change, diagnose an intermittent problem or complete a major repair I recommend Williams Automotive. I went in for an oil change, and I received so much more( Tires rotated, all fluids refilled, and preventive maintenance reccomendations). Dennis has been taking care of my vehicles for a while now, and I will always go back. He is a moral,ethical business man that loves his community. Great service!! Super friendly! They don't "suddenly discover" wrong things!! Came in for two tires to be replaced. They told me a simple repair would do it. I could tell immediately the difference. They saved me over $150. They are more interested in saving you money, and are honest. Will come back for ANYTHING with my car. Thanks guys! Absolutely amazing service! Theses guys are wonderful, will not take my vehicle any where else from now one. Great customer service and made sure I stayed informed on what they found wrong and how long I had until certain things needed to be fixed. Thanks fellas! If you are in or near the Little Rock area and have automotive problems call Williams Automotive. These folks are amazing. Not only are they very experienced in there field. They are probably the most polite and respectful i have seen. When you call them they come and help right away. Very clean shop and waiting area. Just all and all Nice Folks.